Who Will Be Beast of the East? View Poll Results: Who Will Be the Beast of the East? It's against my religion to respond to this poll. Thread: Who Will Be Beast of the East? Which one wins the division now that the Burgundy and Gold are officially done in 2009? Hate to say it but I think the Eagles are playing the best ball and having the most luck on the injury front right now. They have the most consistent QB play in the division and the most experience with having something to play for this time of year. Not sure they can challenge NO or MN in the playoffs but I think they will win the division. I would rather cover my body in gazelle flavored underwear and run thru lion country then vote for any of those crap teams. Memo to self: Never, ever even consider going on an African safari with MikeSr. The Saints or the Vikings should destroy them come playoff time. The Cardinals have a chance of doing the same thing. 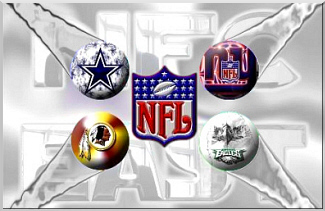 I agree with WD-the NFC East is turning out to be a relatively weak division this season across the board. Call me crazy but I think the Giants will pull it out. I voted Philly. The Giants appear to be in full-on implode mode, and Dallas has a wicked schedule the rest of the way.